Lakhs and lakhs of people floating into the town with milk pots on their heads, beautifully decorated wooden decks on their shoulders, lances pierced into their bodies, it is great to witness the grand festival called ThaiPoosam celebrated by the Tamils towards their beloved God, Lord Dhandayuthapani Temple at Palani, the down south town of Tamilnadu. The festival is rooted in the Hindu Legend and celebrated from time immemorial. Palani is a town in Dindigul district where Lord Muruga abodes in a hill called Sivagiri. There are many legends behind the Lord’s presence in this hill. Interesting one among them is that, once Saint Naradha visited the abode of Lord Shiva at Mount Kailash bearing a special type of fruit. He declared that the person who goes around the world will get the fruit because it is a fruit of wisdom (Gnanapazham). Of the two brothers, Lord Muruga instantly started on his Peacock. But, his elder brother Lord Ganesha, being so clever, convinced their parents by circumambulating them thrice and got the fruit. When the younger one came back, he became so furious on the betrayal and left to a hill which is now called as Sivagiri. The lord here is in the form of an ascetic boy dressed only with a loincloth and no other finery but with only one staff called Dhandam, that is why He is called as Dandayuthapani Swamy. Among all the festivals celebrated in this temple, the most auspicious, most famous, attended by very large number of devotees is the ThaiPoosam festival. It is celebrated in the tamil month of Thai, on the day with the star “Poosam”. According to the Hindu Philosophy, the day is considered to be very auspicious because on this day, Lord Muruga received his invincible lance from His mother Goddess Parvathi so as to destroy the Asura king Tarakasuran. The Demon King Tarakasuran got a boon due to his hard penance that he can be killed only by the son of Lord Shiva. But the Lord Shiva was on a penance, very austere in the rituals and was away from the marriage. So in order to distract His penance, the God of Love, Kama Deva, threw his arrow of lust on Him. When awakened, the Lord became so furious and burnt Kama Deva into ashes. The spirit of love was spread in the air throughout the universe. So, Lord Karthikeya was born to God Shiva and Goddess Parvathi. When He attained the right age, Goddess Parvathi handed over him the powerful lance to Her son to destroy Tharakasuran and his two brothers Simhamukan and Surapadman. He did so and the celestial gods Devas came back to power in the Heaven. The entire sequence of events is beautifully described in the epic “Kumarasambhavam” by Poet Kalidaasa who lived during 4th Century AD. As this festival correlates to the victory of the God over the demons, people believe that by worshipping Lord Muruga on this day will make victorious in their lives defeating all evils from within themselves and also from the materialistic world. The general practice is that people observe rituals for 48 days before the festival. They are strictly away from smoking,drinking and other sinful activities. Most of them eat only once in a day for all the 48 days. Well ahead of the full moon day on which the festival is celebrated, the devotees carrying the offerings to the Lord in long pageants from the different parts of the country start their journey with a strong determination to see and worship their Lord at Palani despite all the hardships on the way. It is quite common to see limousines queuing behind the pageant where owners are walking barefooted. The main attraction of this festival is the Kaavadi. It is nothing but a wooden mount aesthetically decorated with flowers and peacock feathers. 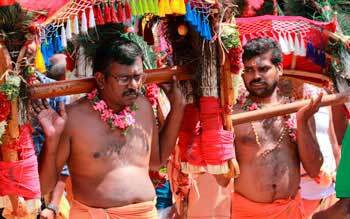 The devotees, as an offering to God, carries the Kaavadis on their shoulders, walking barefooted from very long distances to the temple and implore to God to solve their problems. Normally the number of Kaavadis reaching the shrine exceeds fifty thousand and the count is in the increasing trend year on year. The common forms of kaavadi are milk, sandalwood paste and rosewater. Apart from this, lakhs of people carry milk pots on their heads wearing ochre clothes. Tonnes of flowers in orange and yellow colors are offered to the Lord on this day. We can witness and enjoy the devotees dancing to the tune of drums and tom - tom played on the way to the top of the hill with all the weight on their shoulders. They dance so vigorously as if they are hypnotized by the music. Another form of offering to the God is existing that the ardent devotees torture their body by piercing their cheeks, tongue and skin with lances and even they draw chariots with metal hooks pierced into their skin. It will be threatening to see a large mass of people walking like this but you will not find any words to admire the devotion and dedication of the devotees and their faith on the God. Murugan means beauty in Tamil. Somehow or other, Lord Muruga has been a part and parcel of the life of most of the Tamil families. You can see people named as kandhan, Murugan, Karthikeyan, Subramanian, Vadivelan, Dhandayudhpani, Velayudham in majority of the Tamil families because the culture and tradition of Tamil people lie majorly on Lord Murugan. The festival Thai Poosam inculcates the confidence in every Tamil’s mind and give him morale boost to face any hardships in life and overcome them with the benovelance and blessings of the God. As Lord Murugan is diasporic, the festival is celebrated in a very grand manner in Singapore, Malaysia and USA. More than two million people attend this festival in Batu Caves, Malaysia every year. Lord Murugan is believed to be such a powerful deity that whoever surrenders to his feet will be triumphant in all his endevours. Let’s visit Palani where Lord Muruga is waiting to bestow his blessings on us.